An ex-prison teacher nicknamed "the Cookie Lady" fed homemade biscuits laced with cannabis to four children. Lesley Collins told the two girls and two boys "I'm your nana" before dishing out the "hash cakes" from a knitted bag, The Grimsby Telegraph reported. The 61-year-old, from Cleethorpes, admitted at Grimsby Crown Court on 24 March to supplying cannabis. 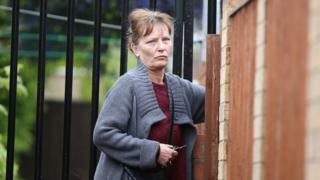 She was handed a six-month suspended jail term and 10 days' rehabilitation when she was sentenced on Monday. The youngsters, three aged 13 and a 12-year-old, had gone inside the Corporation Arms pub on Freeman Street, Grimsby, to use the toilet last October when Collins offered them the "treats". One of the girls felt dizzy and sick and was later taken to hospital after eating half a biscuit, the court heard. The other girl said the biscuit "tasted sweet and disgusting at the same time" as she wolfed it down. Prosecutor Jeremy Evans said Collins, of Bentley Street, was behaving strangely when the children bumped into her. He said: "She kept telling the group that she was a dinner lady and a grandmother." Collins, an artist who had taught people in prison, told police: "It's despicable. I didn't know I had done it. I was drunk." The court heard that she was known as "the Cookie Lady" because she kept a regular stash of homemade cannabis biscuits. Police seized a small amount of cannabis from her home and bags of biscuits were found in a wheelie bin. Mitigating, Nick Worsley, said Collins had acted "utterly out of character" and had no previous convictions. Passing sentence, Judge David Tremberg told the artist: "You were drunkenly oblivious to the risk you posed to them. "This was seriously irresponsible and abnormal behaviour. "If you had not been so intoxicated, you would not have dreamed of doing this." He added that none of the teenagers were "seriously harmed".